Around the summer 2015, I prepared a demo for a customer to show how Oracle Middleware and IBM MQ can interface. When I started to prepare the demo, I googled for a quick example, but I didn’t find one. As a side note: I did find again the JMS article series by John Brown Evans: https://blogs.oracle.com/soaproactive/entry/how_to_create_a_simple. That is still an excellent series of blog posts that will get you started with JMS easily! 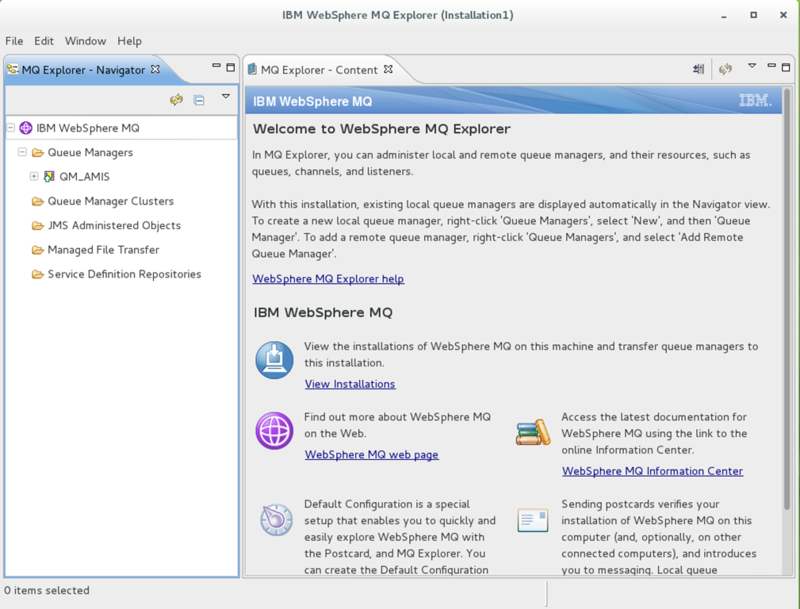 What made the topic difficult is that you need to combine various areas: IBM MQ installation/configuration, WebLogic configuration for the JCA adapters, and making the code – for both BPEL and Service Bus. Oh, and it is now upgraded to SOA Suite 12.2.1. The goal of the article series is to get you easily started on combining Oracle Middleware with IBM MQ Series. As the JCA Adapters are also available for Service Bus, I combined both the Service Bus and BPEL into the use cases. I ended with a short article on the MQ Transport. The JMS over MQ transport is not covered. The choice on what of the above options to use, depends on your customers use case. I recommend to spend some time on it. E.g. the simple statement that ‘the Service Bus MQ Transport does NOT support remote transactions’ should be taken into account. As well as several other properties. You should spend some time on carefully designing this! I kept it simple so you will get to a working configuration. From that starting point, you can add/change features as you see fit. First topic to look into is that of IBM MQ compatibility: the solution has to be supported by Oracle. For both adapters, version IBM MQ 8.0 does not seem to be supported (yet?). I did this with Oracle Enterprise Linux 6.5 and SOA Suite 12.1.3 and found that the MQ installation is sufficient for development purposes. The above article is based on the combination of RedHat Linux 6.5 Operating System with MQ Version 7.5.0.2. Now, I will be using Oracle Enterprise Linux 7.2. Looking at the IBM support information, MQ must be patched to version is 7.5.0.5 (http://www-01.ibm.com/support/docview.wss?uid=swg27027462#Linux_Operating_Systems ). Use Product selector ‘WebSphere MQ’, Installed Version ‘7.5’ and Platform ‘Linux 64-bit x86_64’ to start searching for the fix. There are many more settings / changes that can be done for tuning an MQ system, but for development purposes, the above should be sufficient. For more information, please refer to https://www-01.ibm.com/support/knowledgecenter/SSFKSJ_7.5.0/com.ibm.mq.ins.doc/q008490_.htm. First, the downloaded archive has to be unzip-ed. It was downloaded to directory /home/developer/stage. Unzip as user root. The tcp keep-alive setting is concerned with detecting dead pears and preventing disconnectioins due to network inactivity on tcp level. Since that is not very important for our demo environment, we leave it on the default value of 7200 secs. Which all looks OK, except for the already known tcp keep-alive setting. For the examples we will implement, we need a QueueManager, named QM_AMIS. -q&nbsp;&nbsp; Make this queue manager the default queue manager.<br>-u&nbsp;&nbsp; Dead-letter queue name.<br>-lc&nbsp; Use circular logging. <br>-ld&nbsp; Directory used to hold the log files for the queue manager.<br>-lf&nbsp; Log file size, specified in units of 4 KB pages. <br>-lp&nbsp; Primary log files allocated when the queue manager is created. <br>-md&nbsp; Directory used to hold the data files for the queue manager. -c&nbsp;&nbsp; Redefine the default and system objects, then stop the queue manager. Specifies no sharing of conversations over a TCP/IP channel instance. 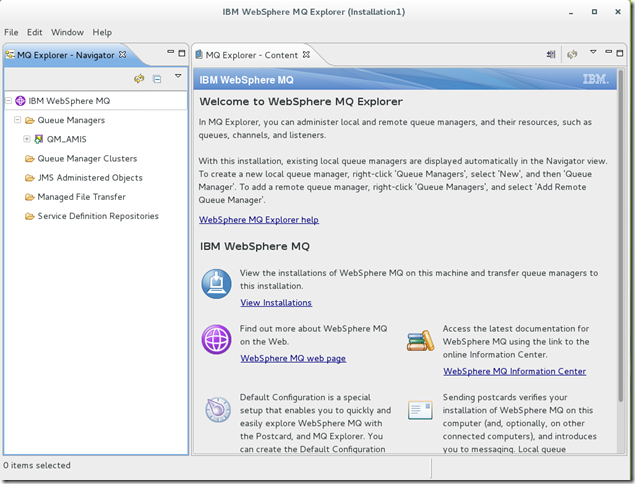 Which shows the MQ Explorer start-up window. Hi! This tutorial works with SOA 11g? The MQ installation will be the same. I expect the BPEL parts of this tutorial will work. However, for OSB, the development environment is different (eclipse) and the JCA adapters for MQ and JMS are not supported in 11g – as far as I know. Please refer to http://www.oracle.com/technetwork/middleware/service-bus/documentation/index.html#11gr1. So, for OSB 11g you will have to work with the MQ transport.